What’s a survey & why do I need one? I was very fortunate yesterday afternoon to be able to enjoy the fabulous sunshine whilst helping a design colleague of mine to survey a garden in Guildford. This got me thinking about the design process and how clients are often quite unaware when I first meet them that a survey of the existing garden will be required before I can produce any design work. The reality is that I am simply unable to do my job without one, so I thought it would be helpful to explain why. 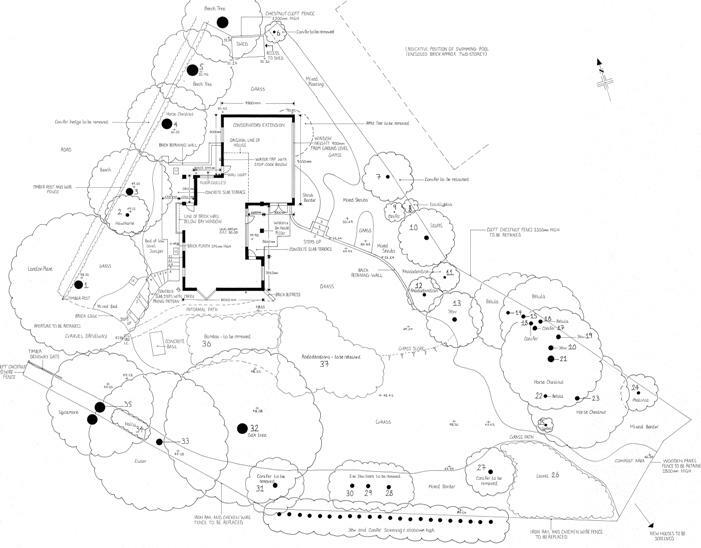 The survey basically plots all existing elements in the garden, the house, the boundaries and any existing garden features such as the terrace, pond, lawn, flowerbeds and any large trees and shrubs. This basic information gives me a picture of the size and shape of the plot and how the house sits within it. In addition, and perhaps most importantly, the survey will supply me with the detailed information I require to be able to work through the design from a construction point of view so, for example, the house will be detailed so that I know the location of windows, doors, air bricks, damp proof course (DPC), drains, downpipes, taps, utilities etc. All changes in level are plotted too so that I am able to get a clear picture of the lay of the land – even the smallest changes in level can affect the construction of any hard landscaping elements. Once I have all this information I am able to truly understand what is there currently. One important part of the design process is to work through the levels using cross-section drawings. The example below shows the proposed new ground levels (solid line) alongside the existing ground levels (dotted line). This process not only helps me to calculate where steps and retaining structures are required, it also enables me to calculate the movement of soil using a “cut and fill” process so that any soil can be moved around on site rather than having to bring in more soil, or remove the surplus, which will only add to the cost of the build. Thanks Fiona – sometimes the levels make my head spin, but it’s well worth it when the design is resolved and the new garden is created! wow, this example makes our little 1.3 metre height difference look measly yesterday. But the survey and getting that on paper makes such a difference to how clients perceive their space. On a smaller scale, – look at your back garden on Google earth, if it doesn’t look how you thought it would then a survey and a plan are a great idea. Indeed it does, but yesterday’s surveying was just as important as this one! You’re right about Google earth, I use it all the time.